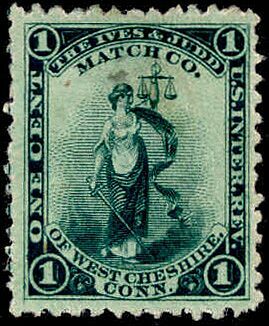 There were a number of changes in the design of the stamps used by the match factory located in Rag Hollow, Connecticut. 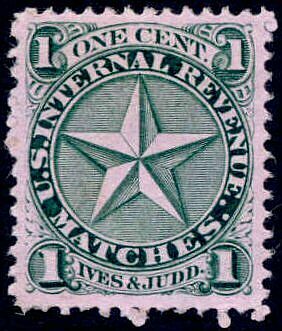 The earliest stamp is that of E. R. Tyler, first issued in September of 1866. 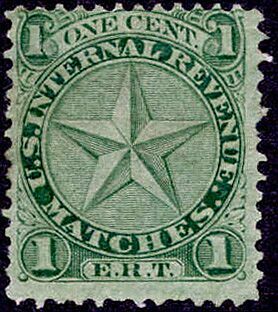 The stamps were used by the firm that bought the company from Tyler as well, until August of 1875. 12,613,020 were issued on old paper, and 14,709,000 on silk paper. The copy shown is on old paper. Ives and Judd purchased the factory from Tyler. They ordered stamps from the Tyler die until they had their own made. These were first delivered in November of 1875. The last delivery was in September of 1878. 9,680,000 were issued on silk, pink and watermarked paper. This example is printed on pink paper. Judd sold his portion of the busines to Charles Bagley around 1867. Ives died, and Edward Dunham took his place. 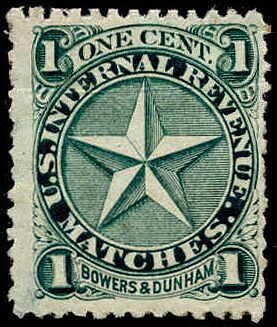 The firm of Bagley & Dunham issued stamps beginning in November, 1878. They were last issued in June, 1880. 1,414,160 were printed, on watermarked paper. The last company in Rag Hollow that used a stamp similar to the E.R. Tyler design was Bowers & Dunham. This partnership did not last long. After about a year Dunham withdrew and Bowers moved the plant machinery to New Jersey. 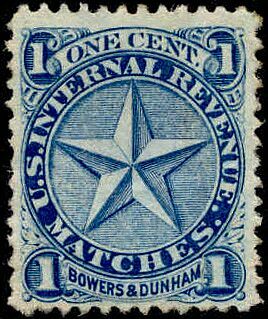 Stampswith the Bowers & Dunham name were originally printed in green, but Bowers did not like the way they looked against the blue matchbox, so the print color was changed to blue for most of the run. The stamps were printed from sometime after July of 1880 until June 23, 1881. 3,765,000 were issued on watermarked paper, but no records were kept of how many were issued in each color. Dunham appears to have obtained new machinery and to have taken control of the factory from mid-1881 until the Diamond Match Company bought it out in early 1882. 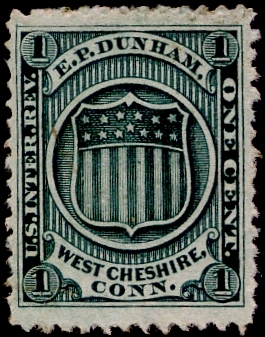 Dunham had his own stamp issued from June 10, 1881 until January 17, 1882. 2,680,000 were printed, all on watermarked paper. There was some sort of dispute connected with the sale of the Dunham Company to Diamond Match, with the result that Dunham again took control of the factory. The firm reverted to the name of Ives & Judd (the widow of Howard Ives was Dunham's sister, and active in the company.) 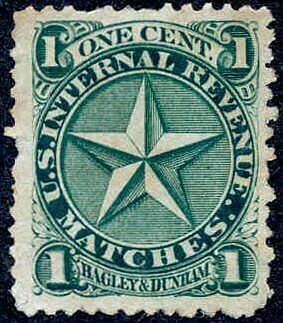 Their stamps were issued beginning in November 10, 1882 and continued untl March 3, 1883, giving them enough to use until the tax was lifted on July 1, 1883. 2,625,000 were printed, on watermarked paper. 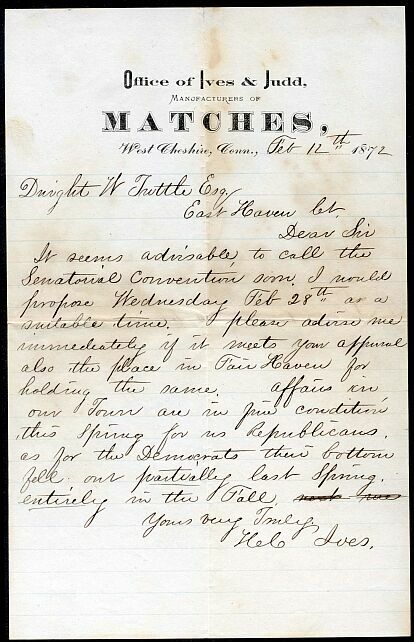 A political letter with an Ives & Judd letterhead. It appears to be signed by Howard Ives, Postmaster of West Cheshire.